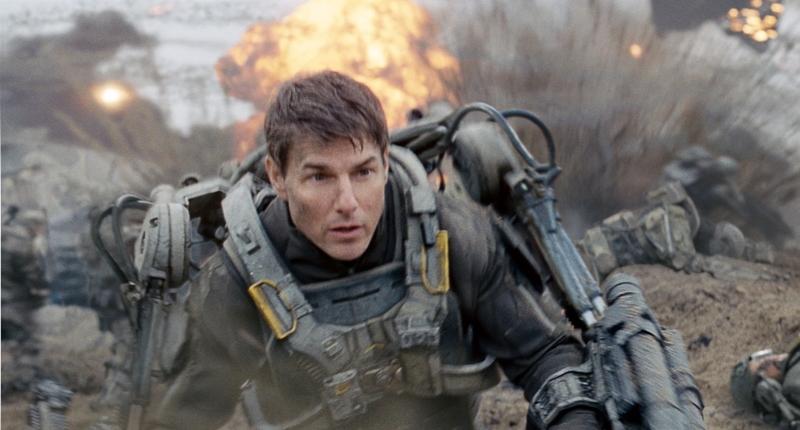 Edge Of Tomorrow Movie Review - Are You Screening? Could be considered somewhat spoilery. No major points are given away, in our humble opinion, but later stages of the movie are discussed. Read at your own risk. Edge of Tomorrow is so niche that it may have trouble ever finding a wide enough audience, and the names involved, and critical reaction may not make a difference. Not only sci-fi, but time travel sci-fi, it’s also loaded with a lot of mechanized, weird alien death and destruction. That certainly isn’t the kiss of death, but Edge of Tomorrow is also a movie that doesn’t care about any of that action, and instead wants you to think a lot, and have a laugh. Aliens have invaded Earth, and they’ve taken over most of Europe. Cage (Tom Cruise) is basically a propaganda officer in the U.S. military, but when he arrives in London, General Brigham (Brendan Gleeson) has the idea to send him in on the front lines of an invasion effort in France. The idea being that Cage will be able to spin a good yarn and sell this invasion to the world’s public, because casualties are going to be the result, no matter how easy this first battle is supposed to be. Cage isn’t on board with the plan, and when the General won’t take no for an answer, he threatens that if he’s going to spin things anyway, he can spin them in a way the General won’t like. This leads to Cage being basically shanghaied into service, and delivered to Master Sergeant Farrell (Bill Paxton) as a supposed deserter. Cage is ultimately suited up in the mechanized battle outfits of the day, and dropped into the assault. Unfortunately, the aliens knew we were coming, and the battle is a slaughter, but when Cage happens to kill one of the “alpha” aliens just before he dies, he wakes up back in time just as he is about to meet Master Sergeant Farrell, and the whole thing starts over again. He obviously can’t convince anyone that he is now “from the future,” and he is left to relive the same bloody day again and again, trying to save people he knows are going to die, always without any positive change. Shazam. Reboot. He eventually aims to try to save Rita (Emily Blunt), who has become the face of this war after great success in previous battles. After a few days rebooting, it becomes clear to Rita that he is protecting her in ways he shouldn’t be able to, and she surprisingly tells him to find her when he wakes up. We soon learn (although it takes Cage several reboots to get to her) that Rita once had this power, and that it is why the aliens are impossible to beat in the first place. Using a “hivemind” theory, the aliens are controlled by the “Omega,” which is a sort of central brain creature. The Omega has the power to control time, and whenever an Alpha is killed, the Omega just restarts the day, but it keeps the knowledge it has, and can then act differently and change the outcome of the battle. Somehow, there’s something about humans that lets them steal this power, so long as an Alpha bleeds all over them… or whatever. The film then plays out, in surprising similarity to the general structure of Groundhog Day, as Rita and Cage struggle to perfect a scenario which will lead to victory. Months and months of reboots may ultimately lead to a dead end, or new information, which requires a change in strategy, but continue on they must, because Cage is just going to keep dying, and no one is going anywhere until something changes. This is already to put off many viewers, but the fun, captivating, action film is only the tip of the iceberg, and like both Groundhog Day, and the Hiroshi Sakurazaka novel All You Need is Kill that Edge of Tomorrow comes from, the film is both allegory and analogy, and it serves up questions, and explores concepts in ways that are impossible without the sci-fi elements. Cruise and Blunt both give spot on performances, which are easy to appreciate throughout the simpler notes of struggle, self-awareness, and examination, but they sell the more difficult, even confusing, constructs as well. By the end of the movie, which with the proper lens is also the world’s greatest romantic comedy, Cage must have been living this day for years, and he is a notably different person, with a weariness about him that speaks volumes on the human condition. More importantly, he remembers years of days with Rita. Conversations and struggles together. A relationship born, and forever at the point of being born, in the ultimate crucible, but one that exists only in his mind. There are enough strings to pull at just in wondering about this spin on love that asks what it can mean for Cage to love Rita, and what that means for our own lives, but these are all simply the stage that sets you up for the look that Blunt so perfectly delivers (twice) in realizing the she loves him. As you might expect from Doug Liman, this is all couched in a slick, surprisingly clever, fast-paced actioner that believes in itself enough to not have to tell you what it’s about. It’s the most intelligent film of the year, so far, by a mile, and on the short list of best sci-fi efforts of the decade.